The Ecooking Men Beard & Body Oil is a multi-functional body oil for men; use it as a body oil, for shaving or for beard care. 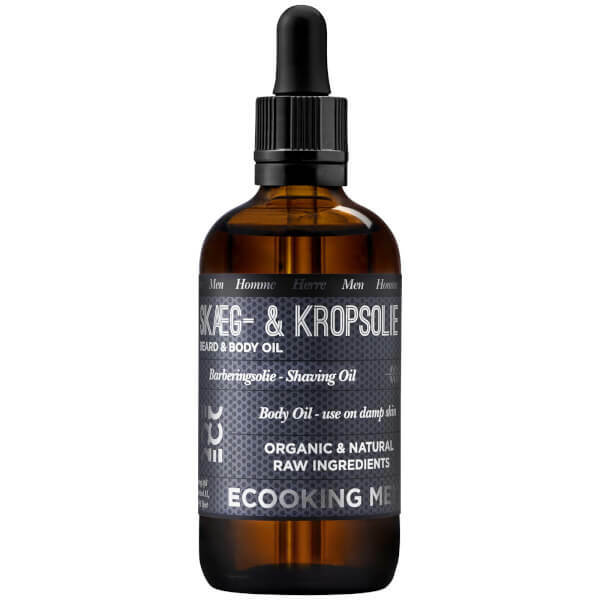 Formulated with organic and natural raw ingredients, the multi-tasking oil is perfect for adding moisture and shine to beards, as a serum before facial cream and even as a massage and cuticle oil. Offering a multitude of uses, it will nourish and soften the skin and hair, helping to relieve dry, flaky scalps. Can even be used in the bath tub or footbath. Infused with a fresh Lemon scent. Remember to always dampen your hair/skin before applying in order for the oil to be absorbed faster and better. Step 1: Dampen the skin. Step 2: Apply oil to the area you wish to shave. Step 4: Finish with facial cream after shaving. Sesamum Indicum Seed Oil*, Prunus Armeniaca Seed Oil*, Simmondsia Chinensis Seed Oil*, Argania Spinosa Seed Oil*, Parfum**.